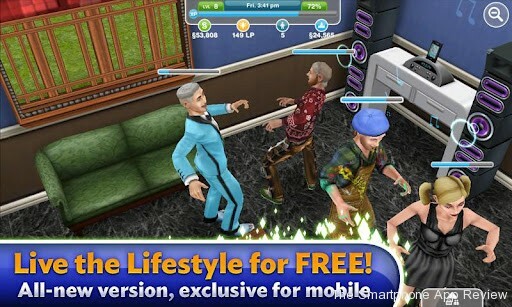 The Sims have made surprisingly few appearances on smartphones, with the only major release being The Sims 3, which has appeared on just about every platform imaginable. 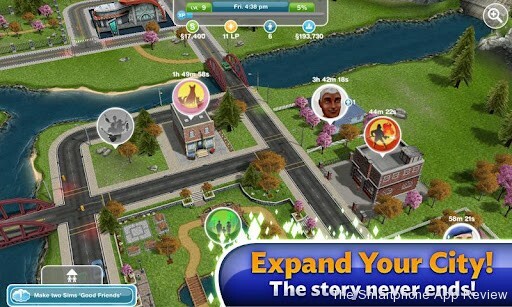 The Sims 3 was a solid, if uninspiring entry in the series for mobile, with very few things you could do, a small town and comparatively few customisation options, although the basic gameplay was fairly decent, and once you had bought the game, you had access to everything, without having to shell out more cash. The Sims Freeplay turns all this on its head. 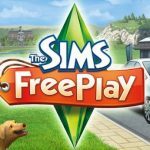 Freeplay is very much a fully featured Sims title, with far more options and content than the previous title, but it has also gone over to a free to play model, which has some major drawbacks. The basic gameplay here is very similar to The Sims 3, but just on a much larger scale. 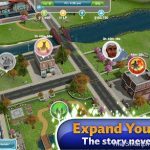 You can grow your city to massive proportions and have a lot of Sims running around it, and the new pets just add to the great feeling of interaction and hustle and bustle of the big city life. It is fair to say that upgrading to the new game from the old does feel like moving from a small town to a big city, and is initially an exciting adventure. Well, as exciting as a Sims game can be, anyway. The whole thing plays in real-time, so if it is night outside for you, then it will be so in your city. This may explain the need to be connected to the Internet every time you play, something that may annoy some players, especially those on a limited data plan. This also, I must add, destroys your battery life. 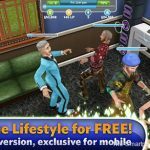 There are many things to do and explore in The Sims Freeplay, from R.C boating, fitting out your home, playing through a chosen career and cooking. The problem with all this however, and with the game in general, is the fact that almost everything in the game costs money. Not a problem in itself, as this is titled as a free to play game, but earning cash in the game takes an excruciatingly long time, meaning either a long wait or spending some real money to speed things up or buy items outright. The issue with going away and leaving the game is that, if you leave it too long, your Sims will begin to die of starvation. It all feels like a ploy to get you to log in each day, get fed up of waiting and spending some cash, when the focus should be on consumer enjoyment. This ploy is of course in other games, but the need to prevent losing many hours of play by playing everyday seems very cheap and quite a low shot at customers wallets. The prices for Simoleons and Life Points at the in-game store don’t help as they are very expensive indeed, and equate to quite an investment, adding to the money loop. If you spend money then it is an even bigger risk to let your Sims starve, so you must log in again and again, and it all gets tiresome very quickly. The fact that, even if you do spend money you are still served ads really does annoy. The graphics are decent here, and are about as good as the console versions, give or take a texture or two, and it all runs pretty smoothly. You will be spending a lot of time waiting for things to happen in this game, so you had better get used to the animations and interactions between the characters. The iPhone version of this game has a feature where you can have babies and start a family, but that has been mysteriously dropped for this Android release. Hopefully it will form part of a future update. 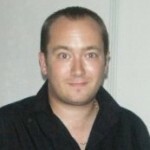 Overall, Android user have got a lot to look forward to this year, what with the news about Android Jelly Bean and various amazing looking handsets on the horizon, but unless you have the patience of a saint or are prepared to blow $100 dollars on a mobile game, then The Sims Freeplay isn’t one to be excited about. Good at what it does, but has the feel of a cash grab, and in all honesty, The Sims 3 is probably better value for money, even if this is free. Check out our developer interviews and our reviews of Final Fantasy Tactics and Spectral Souls!